Ventura, pop. 101,000, is on the coast 53 miles west of Los Angeles. New camera locations may be coming in 2019. See Set # 2, below. Some of Ventura's tickets can possibly be ignored. If your "ticket" does not have the Superior Court's name and address on it, it is what I call a "Snitch Ticket." For more details, see the Snitch Ticket section on the Your Ticket page. 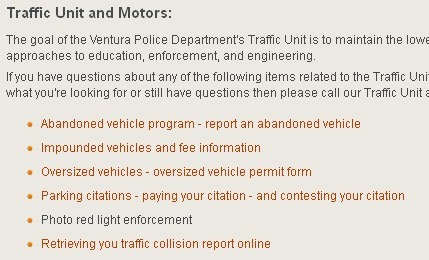 If you have a ticket from the City of Ventura, please be sure to contact me. These annual totals, or projections, are by highwayrobbery.net. The projections are based upon only the data shown in the table above. Except where noted otherwise, the figures given in the table are for the single calendar month indicated. Any figures in red type (or, if you are looking at this table in black and white, the upper figure when there are two or more figures in a cell) are what RedFlex calls Total Violations, or Total Processed Incidents, or all incidents recorded by the cameras. The figures in black type are what RedFlex calls Notices Printed, and represent the sum of genuine citations issued (those filed with the court) plus any Nominations mailed (not filed with the court, a.k.a. Snitch Tickets). Due to time limitations data may have been posted to the table only for selected months or locations. If there is sufficient public interest, the remaining months or locations will be posted. Full official data has been received and is available at one of the links given above. The official report for this month covered less than the full month, so we increased the official In Progress figure by the appropriate proportion of the first Sub Total Violations figure, then we increased the Approved Violations figure by the adjusted number of violations In Progress times the 55% issuance seen in 2016. The camera enforcement is believed to be on traffic on the first-named street, but the direction of enforcement (north, south, east, west, thru, left) is not yet available. See Set # 3, below. For an unknown reason, the reports received in Feb. 2014 did not include the VIOP camera. It may have been temporarily out of operation. Reports received later included VIOP. Two cameras are to be removed and up to three new camera locations may be coming, in 2018 or later. See Set # 2, below. See Docs Set # 7, below. From the annual reports required, beginning with 2013, by CVC 21455.5(i). They become available by the Fall of the following year. Also see Set # 5, below. Ventura's former main contract of 2006 (staff report) with RedFlex was signed in May 2006 and included an illegal Cost Neutrality clause, whereby the city did not have to pay RedFlex the full monthly rent (the so-called "fixed fee") if the fine revenue wasn't sufficient to cover the cost. See Subsection B. of Defect # 10. The 2006 contract did not require Ventura to ticket rolling rights, and the City chose - correctly - to give it very little emphasis. Because of the resulting low fine revenue (combined with the cost neutral terms), by late 2008 Ventura had paid RedFlex $1.7 million less than the cumulative "fixed fee." See the clause and the invoices here. [If] The city fails to enforce right turn violations (from automated red light violations), in good faith and due diligence, if and when systems are configured for this purpose as mutually agreed between Redflex and the City." In Jan. 2009 senior VPD personnel told me that the City's position was that it did not owe RedFlex the $1.7 million. Invoices and other documents covering March 2013 showed that in that sample month the City received $36,865 in fines from the court, kept $20,472 to cover its "Customer Operating Costs" (per Exh. D of the contract) and paid the remaining $16,392 to RedFlex, which had billed the City $37,908 (18 cameras at $2106 each). The one-third increase in ticketing which began in Aug. 2013 put more tickets "in the pipeline," thus gradually increased the City's monthly fine revenue to the point where the City was able to pay more to RedFlex. Invoices and other documents received in early 2014 showed that RedFlex was paid $37,111 for its services during the month of Jan. 2014, more than double what the company was paid the previous March, and much closer to the $39,424 the company began billing the City each month after a May 2013 price increase. Despite the increase in ticketing, by Summer 2014 the City owed RedFlex an additional $1 million, for a grand total of $2.7 million. 2015: Up To Seven More Years - With a Quota? The term of the 2008 (amended) contract ended/expired in Nov. 2013, after which it was allowed to continue on a month-to-month basis. At a Sept. 2014 meeting the council was presented with a staff recommendation to extend the program for up to seven years, the last four of which would come from two automatic two-year extensions. The proposed new contract would have continued Cost Neutrality and kept the rent at $2190 per camera per month. It provided that RedFlex would write off $1.7 million of the $2.7 million debt. The vote to accept the staff recommendation was a 3 - 3 tie (Ayes: Tracy, Monahan and Nasarenko, with Morehouse absent). After that, the council unanimously adopted a new motion which was to continue the month-to-month extensions of the old contract to allow staff some time to gather more information and prepare a new report. Up To Seven Year Contract OK'd at March 30, 2015 Council Meeting, with More Cameras - and a Quota? At the March 30 meeting the council voted 6 - 1 (Nay: Heitmann) to accept a revised contract. The monthly rent remained the same ($2190 per camera), but the two two-year renewals were changed from automatic to optional. Based upon the rent other cities pay - see FAQ # 17 - Ventura should not have agreed to pay more than $1500 per camera, or $27,000 per month for all 18 cameras. Because it agreed to continue to pay $2190 for another seven years, the City will overpay by $1 million and will need to issue an extra 10,000 tickets to cover the overpayment. The president of RedFlex was present at the meeting, and spoke. "Redflex... will relocate three existing red light camera approaches..." and " ... once we move the 3 locations we anticipate revenue to increase and therefore the [potential] extension to decrease." Here is a survey RedFlex did, to look at potential ticketing at possible new locations. From 5-12-15 email RedFlex sent to City, obtained 12-19-16. The cut-off bottom is as received from the City. 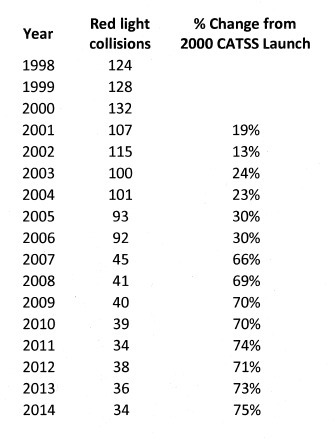 The March 30 staff report also included this deceptive table. "The way the police department reports collisions now is vastly different than we did when we started this program. Now we only report - correct me if I'm wrong - now we only report injury or major property damage collisions. That's different. Our total collision numbers are down quite a bit because the reporting is different." The new contract approved in 2015 did not include a Termination for Convenience ("escape") clause, so the City is locked in to the contract until it expires. In Feb. 2017 the City agreed to extend the contract expiration date by 39 days (to May 2018) after a calculation showed that the City's payments to RedFlex had fallen $50,406.32 short of the amount billed. In May 2018 the city council approved a two year extension, to 2020. If, in 2020 the city council approves another two-year extension, the contract will continue until 2022. To see how much money the City has received from the Court, see Set # 7, below. The figures are also posted in a column in Set # 1, above. This list of contracts and amendments was up-to-date as of 5-7-18. In June 2009 the Ventura County Grand Jury issued a report recommending the the yellow at the California/Thompson intersection be lengthened. The Calif./Thompson ticket counts for July 2009 onward (see table above) show a reduced ticket volume, which will make it more difficult for the City to pay off the debt it owes RedFlex. See article (including link to the 2009 report). "Also, increased time for the yellow turn arrows and delayed green lights would help the confusion at the Corridor traffic signals. Further, the Grand Jury recommends that traffic planners initiate the process to complete the connection from westbound Hwy 126 to the southbound Hwy 101. If these recommendations are not implemented, red light cameras along the Corridor should be removed." "The Grand Jury found that red light camera tickets issued along the Corridor may be questioned as to their validity due to driver confusion. While the red light camera tickets appear to be legal, they may not be ethically or morally justified." "The intersection at Victoria and Telephone Road appears to be the major intersection on this route that highlights the traffic flow problems along the Corridor. The Grand Jury found that the left turn lanes at this intersection have created many red light camera tickets." The City was required to respond, and that response was discussed at the July 15, 2013 council meeting. If you would like to read some grand jury reports from other counties, about their red light cameras, see the Grand Jury entry in the Site Index. Until 2014, the City provided bar graphs of Late Times, etcetera. In 2014 Ventura stated that the bar graphs are no longer available. An official report showed that in 2014, 53% of the City's tickets were for left turns. When the program first started the City had a lot of information posted on its website. But by 2011 the information was no longer available online as the link had become dead. 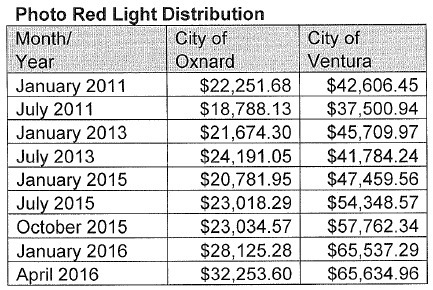 In May 2016 we asked the Ventura County Superior Court how much red light camera fine money Oxnard and the City of Ventura were getting, during selected months. Here is the table they sent. The figures from this table have also been posted in a column in Set # 1, above. In March 2017 the City of Ventura sent us documents showing the revenue during selected months in 2014 and 2016. Those figures have also been posted in a column in Set # 1, above. In Aug. 2018 the City sent us more documents showing revenue and expense in 2018. In Sept. 2018 the Court sent us documents showing the City's revenue in 2016 - 2018. We have asked them to double check the $165,544 figure they reported for July 2018, as it seems too high for the quantity of tickets issued. Most of those figures have also been posted in a column in Set # 1, above.